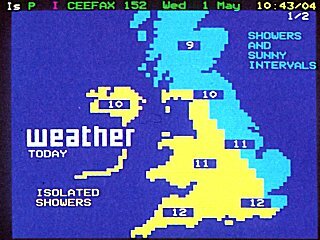 This page presents CEEFAX frames seen on BBC1 and BBC2 before 1991. 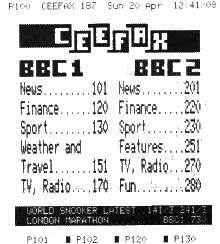 This is a very early CEEFAX page, dating from January 1975 when the service was still classed as experimental. Only 30 pages were broadcast, 8 of which were test pages. This page has been reconstructed from a black and white photograph so I do not know if/what colours were used. Can anyone help out? 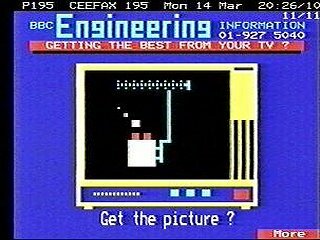 The data for this image is taken from BBC Engineering information sheet 4008 (issue 5) dated October 1975, and the date in the header row confirms the page is indeed of 1975 vintage. Talk about information fatigue syndrome! 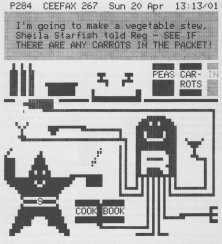 ... and by 1978 there are two magazines filling 100 pages each. All that's missing now are background colours. 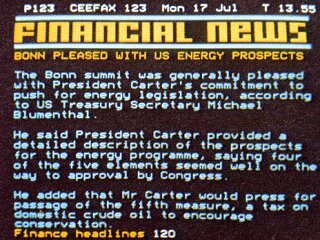 This style of newsflash persisted for many years. 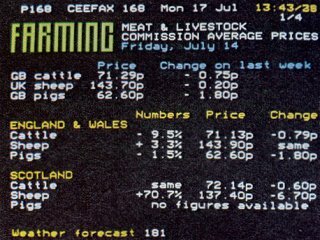 I wonder how many farmers had CEEFAX in 1978? Not that without background colours the weather map looked much clunkier, requiring a blank cell to change foreground colour. 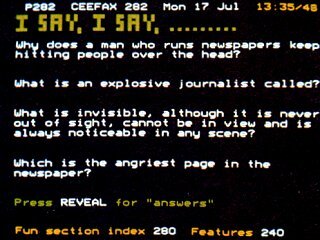 The Fun section (index 280 on BBC2) made early and extensive use of teletext's reveal/conceal feature. 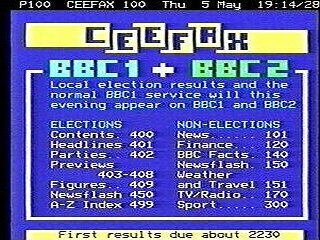 By the late 1970s CEEFAX had standardised on sub-page labelling as 1/2, 2/2 etc. Previously, they had also used A B C, and if you were viewing sub-page A, then the A would appear flashing. 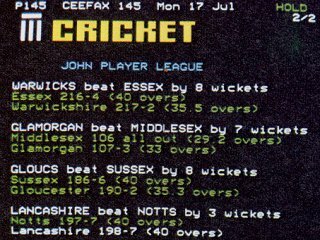 Teletext graphics are something of an art form, and it is surprising what can be achieved with chunky blocks and eight colours. 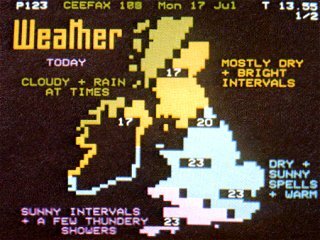 This is a very rare sighting of the lesser-spotted BBC2 main index page from May 1980, when BBC2's CEEFAX service was branded as ORBIT. 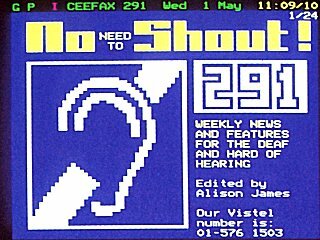 The header row shows P198 (which at that time would only have been transmitted on BBC1), possibly because a magazine of selected pages had been set up there temporarily for demonstration purposes. Normally it would have been BBC2's P200. 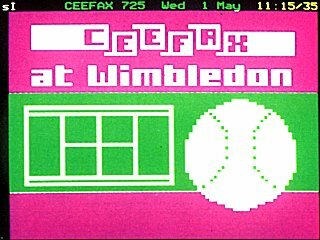 Thanks to Mark Cook and his (t)rusty BBC-B tape drive you can see the whole magazine (give or take a few sub-pages) and spend An Evening with CEEFAX! I don't think all the page numbers were as indicated in the header row. No road works between junctions 1 -9 - hooray! Once again there is no weather in northern Scotland. Check out the old London 'phone prefix! Remember the days when Radio One and Radio Two shared the FM frequency? Well it wasn't really sharing, Radio Two had it most of the time, with R1 allowed 2200-0000 every night and 1700-2200 on Sundays. I remember listening to the end of "Sing Something Simple" every Sunday, waiting for the Top 40 to come on. " S-t-e-r-e-o - 275 and 285 and Stereo V.H.F!" 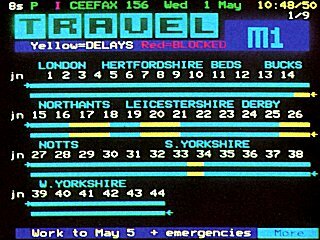 The full might of the CEEFAX graphics department is brought in to demonstrate where you can pick up the new Radio 1 FM service. The temporary frequency of 104.8 MHz allowed London to have Radio 1 in stereo well before the rest of the country. (Later it moved to 98.8 MHz.). The frequencies were not freed up at the same time, which meant that Radio 1 FM started off using all sorts of odd frequencies to begin with. These three pages all date from 1988. 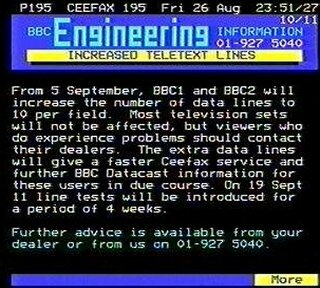 In September 1988 the BBC were increasing the number of spare tv picture lines being used to transmit teletext. This meant information could be transmitted faster. Note the 01- telephone code for London. 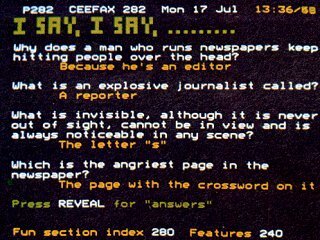 A thought-provoking Fun and Games pages page from September 1988. In April 1989 the BBC were suffering from industrial action. 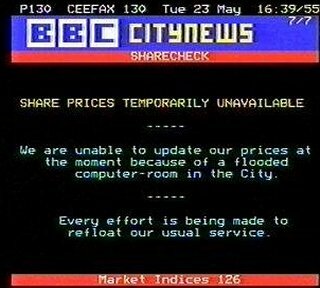 The CEEFAX Citynews staff showing humour in the face of adversity in May 1989. 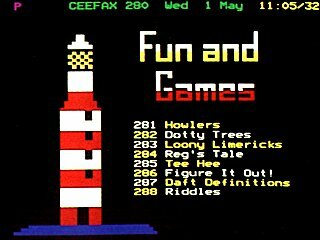 August 1989: Sad news of the end of the CEEFAX Fun and Games section, which had been a popular feature of the BBC2 service for ten years.